Question: VMware VSAN is popular now a days and do you have any experience in that one? 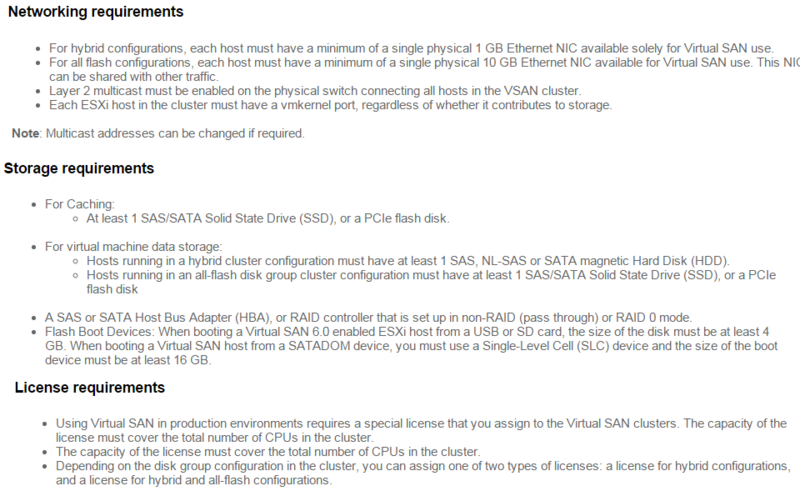 Can you brief pre-requisites of VMware VSAN? Have you ever faced any issues with VSAN setup? If yes how you recovered it? Most of us not blessed to Install & Configure VMware VSAN in Customer Infrastructure but soon you will be assigned to that role as the Storage slowly moving to VSAN world. Virtual SAN 6.0 comes with a Health Services plugin. This feature checks a range of different health aspects of Virtual SAN, and provides insight into the root cause of many potential Virtual SAN issues. 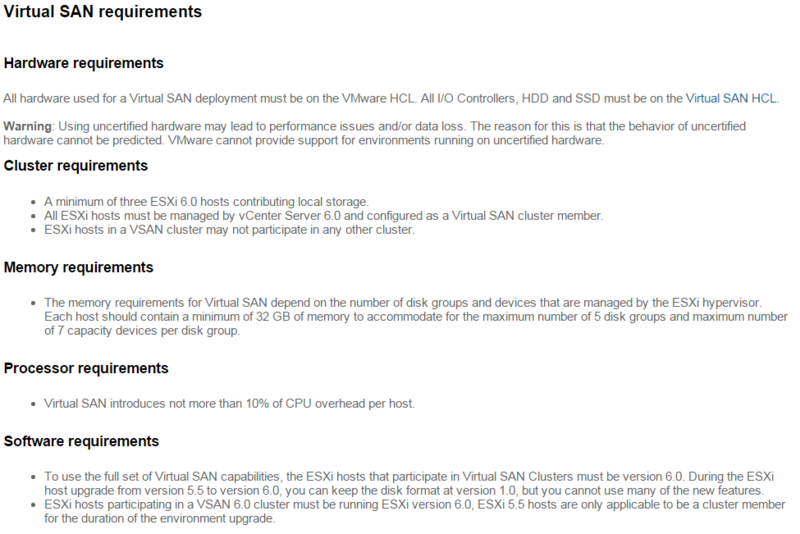 The recommendation when triaging Virtual SAN is to begin with the Virtual SAN Health Services. Once an issue is detected, the Health Services highlights the problem and directs administrators to the appropriate VMware knowledge base article to begin problem solving. Once you know the pre-requisites and next step is collecting Virtual SAN (VSAN) support logs. Virtual SAN support logs are contained in a normal ESXi support bundle in the form of VSAN traces. The VSAN support logs are gathered automatically by gathering the ESXi support bundle for the hosts. As VSAN is distributed across multiple ESXi hosts, VMware recommend you gather the ESXi support logs for all hosts configured for VSAN. As Virtual SAN is a software-based storage product, it is entirely dependent on the proper functioning of its underlying hardware components such as the network, the storage I/O controller, and the storage devices themselves. As Virtual SAN is an enterprise storage product, it can put an unusually demanding load on supporting components and subsystems, exposing flaws and gaps that might not be seen with simplistic testing or other, less-demanding use cases. Indeed, most Virtual SAN troubleshooting exercises involve determining whether or not the network is functioning properly, or whether the Virtual SAN VMware Compatibility Guide (VCG) has been rigorously followed. As Virtual SAN uses the network to communicate between nodes, a properly configured and fully functioning network is essential to operations. Many Virtual SAN errors can be traced back to things like improperly configured multicast, mismatched MTU sizes and the like. More than simple TCP/IP connectivity is required for Virtual SAN. Virtual SAN uses server-based storage components to recreate the functions normally found in enterprise storage arrays. This architectural approach demands a rigorous discipline in sourcing and maintaining the correct storage I/O controllers, disks, flash devices, device drivers and firmware, as documented in the VMware Virtual SAN VCG. To resolve this issue, check all ESXi host nodes in the VSAN cluster and ensure that their configuration is correct and all VSAN hosts are in the same network subnet. hi bro, once please share faq’s bro. Hi Satish Anna..well information.. Plz update ticketing tool concepts..
@ Kranthi Kumar …Good Luck ! You article is informative but in a scenario where you dont have any storage and need to start with Virtual SAN bootstrapping Virtual SAN to vCenter will be helpful , you might want to consider adding that to your upcoming articles.